A 69-year-old woman presented to her primary physician complaining of a “raspy” voice for approximately one month. She denied having any dysphagia, chest pain, shortness of breath, or cough. After being referred to an ear, nose, and throat specialist, she was sent for outpatient imaging of the neck and chest. 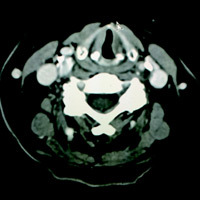 Contrast-enhanced CT (CECT) of the neck revealed only slight medialization of the left vocal cord (VC). The left aryepiglottic (AE) fold was not asymmetrically thickened, nor was the left piriform sinus dilated. No mass or lesion was seen along the course of the left tracheoesophageal (TE) groove through the neck. CECT of the chest revealed multiple, variable-sized pulmonary nodules, as well as a fairly large nodal conglomerate embedded within the aorticopulmonary (AP) window. Left VC paralysis secondary to mass effect upon and/or infiltration of the left recurrent laryngeal nerve (RLN) from pathologic adenopathy within the AP window. Left-sided VC paralysis can result from disease affecting cranial nerve X (CNX) along its course from the medulla to the RLN branch, the latter of which commences at the AP window. Sequentially along the path of CNX, pathology within the jugular foramen, carotid space, mediastinum, and TE groove may be implicated. Clinically, patients may present with hoarseness, dysphonia, or as in this case, a raspy voice. Classic imaging findings of VC paralysis include a medialized, thickened AE fold, dilatation of the ipsilateral piriform sinus, a dilated laryngeal ventricle (“sail sign”), and a medialized VC. In this instance, only subtle medialization of the left VC was noted. CECT is the preferred imaging modality to evaluate hoarseness and/or suspected VC paralysis. Since the left vagus nerve courses into the mediastinum and recurs through the AP window, imaging of the neck and chest is ideal. If only a neck CT has been ordered, scanning of the neck should extend from the skull base to the carina. Etiologies of left-sided VC paralysis include neoplasm, trauma, and various other idiopathic mechanisms including vagal neuropathy. Posttraumatic cases include iatrogenic injury to the RLN (eg, nerve transection) that may occur during thyroid surgery, carotid endarterectomy, and/or anterior cervical discectomy/fusion. Neoplasms anywhere from the skull base to the AP window must be excluded if there is no history of trauma or surgery. Tumors within the jugular foramen (eg, meningioma, glomus tumor), the neck (eg, thyroid carcinoma, pathologic adenopathy), and within the chest (eg, lung cancer, AP window adenopathy), etc are all differential considerations. In the case shown, there was no history of trauma or surgery. Aside from subtle signs of left VC paralysis, no space-occupying lesions were seen along the left TE groove, nor was there pathologic neck adenopathy. 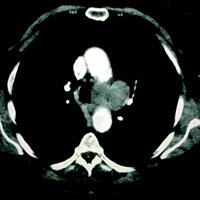 A separate imaging study of the chest revealed pathologically enlarged AP window lymph nodes. From a diagnostic point of view, imaging is critical. But that’s not enough—a thorough understanding of skull base, neck, and chest anatomy is essential, as is a methodical search pattern. Kumar VA, Lewin JS, Ginsberg LE. CT assessment of vocal cord medialization. AJNR Am J Neuroradiol. 2006;27(8):1643-1646. Ardito G, Revelli L, D’Alatri J, Lerro V, Guidi ML, Ardito F. Revisited anatomy of the recurrent laryngeal nerves. Am J Surg. 2004;187(2):249-253. Myssiorek D. Recurrent laryngeal nerve paralysis: anatomy and etiology. Otolaryngol Clin North Am. 2004;37(1):25-44, v.